The Champions of Europe will be celebrating 100 years of the Spanish Football Federation this upcoming Saturday, November 14th in a friendly match versus Argentina at the Vicente Calderon. 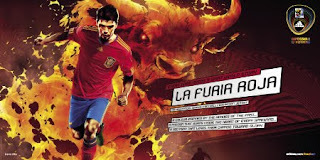 La Furia Roja will also be wearing their brand new Official adidas Spain National Team 09/11 Soccer Gear! This sharp red shirt with blue and yellow trim commemorates the Spanish Football Federation's centenary, and will be the jersey Fernando Torres, Sergio Ramos, Cesc Fabregas and the rest of the star-studded Spain roster will wear for South Africa 2010. This sweet new jersey includes addias ForMotion: The innovative technology that offers maximum comfort and perfect fit, with features like three-dimensional design, different combination of fabrics for greater flexibility and special stitching to eliminate friction during intense action. Plus, adidas ClimaCool® - advanced material engineered to reduce heat and moisture build-up, allowing increased comfort and performance – to keep you feeling fresh no matter how long you play, train and cheer on your Furia Roja in World Cup 2010!